This past Wednesday, Vivian and Alberto Lombardi hosted the Kick-Off for Fashion Stars For A Cause (FSFAC) at Lounge 31 and according to charity's founder, Yvonne Crum, "It was packed to the hilt!" After the death of her oldest son years ago, Crum sought a way to bring attention and understanding to the usually taboo subject of suicide. Through the Fashion Stars For A Cause program, she has paired the unlikely topics of suicide and fashion together with funds benefiting the North Texas Suicide and Crisis Center. 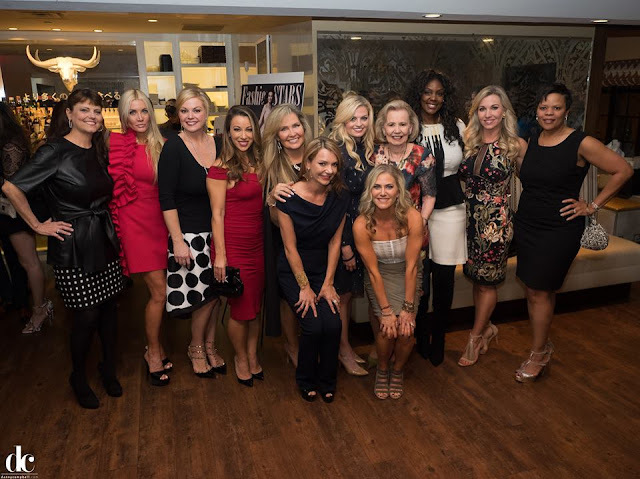 Twelve women were announced as the 2017 FSFAC ambassadors and will walk the runway at the 2017 gala on March 24. They represent a diverse group of interests, backgrounds and professions and are committed to raising awareness and critical funds for Suicide and Crisis Center of North Texas. They include: Tadia Hunt, Sara Dawn Wilkins, Debbie Stout Elchami, Shay Geyer, Maria Luce, Carinthia Kishaba, Donna Richardson, Jenny Anchondo, Jennifer Smith, Abra L. Garrett, Jordi Bostock and LaToya Jones. At the soiree it was also announced that Caroline Rose Hunt will be the Honorary Chair for Fashion Stars for a Cause 2017. "Caroline has supported all 10 years I have been raising funds for Suicide and Crisis Center of North Texas and attended all of them," said Crum, "I am thrilled that she agreed to support the 2017 gala as Honorary Chair." Eric Nadel will be the event's featured speaker. Nadel is the voice of the Texas Rangers and close friend of Rusty Rose, one of the owners of the Texas Rangers that took his life this past year. Event if you can't attend the gala, you can still support the cause by buying a raffle ticket. The prize is a once-in-a-lifetime trip aboard the magical Orient Express and includes: one twin cabin aboard the Venice Simplon-Orient-Express London to Venice (or vice versa) journey throughout the 2017 season, Roundtrip airfare for two to London on American Airlines, a $5,000 gift certificate to J. Pacetti Precious Jewels, one custom tuxedo from Q Clothier and one custom gown from Binzario Couture. Tickets can be individually purchased at $100 each or $500 for 6 tickets. Purchase them from your favorite FSFAC ambassador or purchase online.